Hello and welcome to my website that I created. This Web site is dedicated to Sasami and spreading the Sasami fandom across the universe. 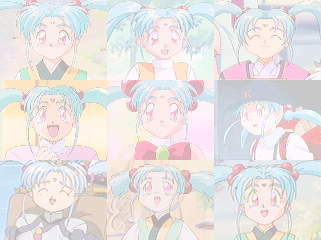 In this Web site you find some information and images of Sasami and some of the other characters from Pretty Samy and the "Tenchi Universe". The music playing is Aeka's Bojo. Why Aeka's Bojo? Well because it's my favorite piece of music from the Tenchi series. It was composed by Seikou Nagaoka for Tenchi Muyo! Ryo-Ohki and is now the theme to my Web site. If you would like to Download it you can do find it here. Sasami is a member of the Jurai royal family. She is the second princess after her sister, Aeka. By Earth standards she is about 8 years old. Also she was in suspended animation for a long time making her actual age about 700 years older. Her age by Jurai standards is different but I don't remember the difference of year length of Jurai as compared to Earth. Sasami first comes to Earth by her sister's spaceship, Ryu-oh. She was aboard the spaceship with her sister who was pursuing the space pirate Ryoko. Aeka and Sasami were frozen aboard the ship until the ships computer was able to locate Ryoko. 700 years had passed on Earth when Ryoko was finally located. Sasami is once again the second princess of the Jurai royal family. In the TV series Sasami travels to Earth on her own spaceship after Aeka got stranded on Earth. Unfortunately Sasami also became stranded on Earth with her sister shortly after arriving on Earth. Unlike the OVA series Sasami was not preserved in suspended animation. In this series all of the usual girls, including Sasami, are already on Earth at the beginning of the series. They all arrived there on the same day by when Ryoko was running from the Galaxy Police in a spaceship built by Washu. Princess Aeka was also in pursuit and all three ships ended up getting destroyed leaving all 6 girls stranded on Earth at the Masaki Shrine. In this series Ryo-Ohki is Sasami's pet and not a spaceship belonging to Ryoko. Also Ryo-Ohki has the ability to turn into a giant bunny robot. Like Always Sasami is the second Princess of the Jurai royal family. 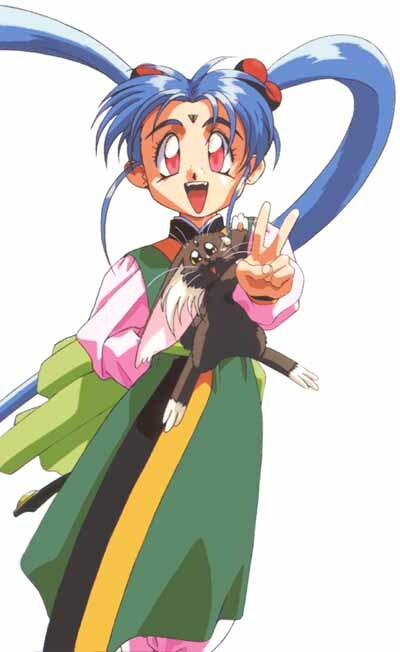 Among other things Sasami's hobbies include cooking and playing with Ryo-Ohki. She is often the character who acts the most mature notwithstanding the fact that she is the youngest character. She is kind and out going and is always there to be a good friend. In this series she is Sasami Kawai; a 10 year old girl who is a 4th grader at her elementary school. In this series She has a brother, Tenchi, instead of a sister. 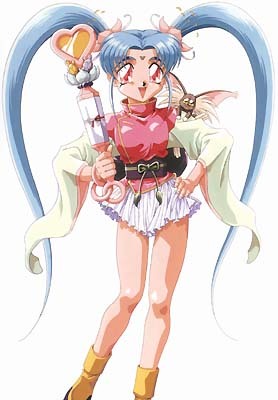 Sasami Kawai was chosen by Tsunami to be the magical girl, Pretty Samy. Her duty is to fight for justice and bring peace and balance to the world. Tsunami's rival, Ramia, also chose a magical girl to get in Samy's way. Ramia's magical girl is named Pixy Misa. It is unknown to Sasami that Pixy Misa is actually her best friend, Misao, who was forced into becoming the evil magical girl. In the TV series Sasami once again is is a 10 year old girl in the 4th grade. She attends the Umi no Hoshi Elementary School. She lives at home with her not so normal parents who a run a shop called CD Vision. She is once again chosen by Tsunami to become a magical girl. The more good Pretty Samy does the more the gemini becomes balanced. Once again Tsunami's rival, Ramia chooses a magical girl to get in Samy's way. Out going and cheerful Sasami likes to play dodge ball and is an excellent player. Her hobbies include hanging around her best friend Misao, playing video games, playing with Ryo, and going places with her father. 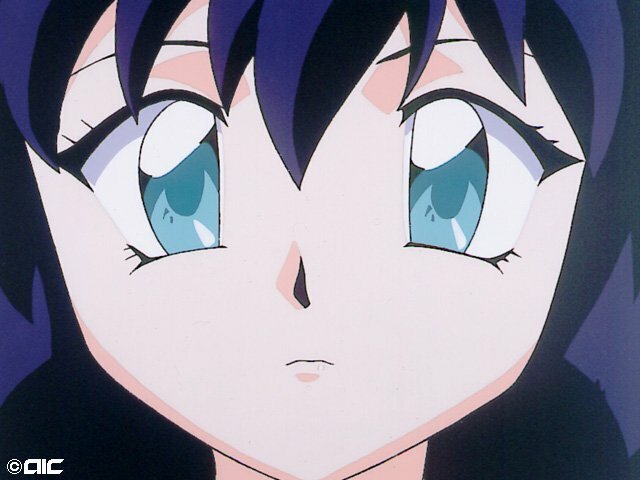 In the Pretty Samy OVA Sasami Kawai is chosen by Tsunami to be her champion to bring balance to the universe. She is challenged by Pixy Misa the evil magical girl who's only purpose is to get in Samy's way. Pretty Samy not knowing how to use her magical powers ends up taking a crash course in learning her magical abilities while fighting the love-love monsters summoned by Pixy Misa. With instruction from Ryo-Ohki Pretty Sammy was able to defeat the love-love monsters and return everything back to normal. In the Pretty Samy TV series Tsunami was chosen to be queen of Juraihelm before she can become queen she must choose someone to become a magical girl and return the gemini to balance. She chose a 10 year old girl named Sasami Kawai. Pretty Samy didn't want to be a magical girl but before she could tell Tsunami that she didn't want to be a magical girl Tsunami was already on her way leaving Sasami with the magical baton and Ryo. Notwithstanding the fact that Sasami Kawai is an expert dodge ball player it seems that when she is Pretty Samy she always complains about how physically demanding being a magical girl is. Pretty Samy being the transformed version of Sasami Kawai shares the same personality and traits of Sasami. She can use the Pretty Coquettish Bomber to cancel magic and return love-love monsters back to their normal form. In the OVA Misao is a sickly girl who's only friend is Sasami. She spends of her time at home alone as her mother is always working. Her mother usually orders dinners for her from "the usual place" when she is away. Unknown to her she was chosen by Ramia to become the evil magical girl, Pixy Misa. In the TV series Misao isn't the sickly that she is in the OVA. Instead she is very shy and uninvolved. Her father is a world famous pianist and has been over seas for most of her life. Her mother works often leaving Misao home alone. She was chosen by Ramia to become Pixy Misa the evil magical girl in order to prevent Samy from doing good. Misao has no knowledge of being Pixy Misa or of the trouble she causes to Pretty Samy. Misao is a 10 year old girl in the 4th grade who loves to be around her friend Sasami. Often lonely she spends lots of her time playing the piano. In the OVA Pixy Misa is created by Ramia by transforming Misao Amano. When Pixy Misa turns back into Misao she has no memory or knowledge of ever being Pixy Misa. Her only purpose is to get in Pretty Samy's way in an attempt to prevent Tsunami becoming queen of the magic kingdom. For Pixy Misa her TV series version is almost the same as her OVA version. She is the other side of Misao created to prevent Tsunami from becoming queen of Juraihelm. Pixy Misa is Pretty Samy's rival. She uses her magical baton to summon the mystics which can turn objects and people into love-love monsters. Her hobbies include torturing Sasami, torturing Pretty Samy, taking the spotlight, talking in weird English, lazing about, eating, and above all else having fun. In the OVA Tsunami is the most powerful ship in the Jurai fleet and belongs to Sasami. Tsunami's humanoid form is what Sasami Jurai will look like when she is older. When Sasami was little she had a fatal accident that would have cost Sasami her life. Tsunami joined with Sasami's body to save her. In the Pretty Samy OVA Tsunami is chosen to become queen of the magic kingdom but before she can be queen she must first choose a champion to do good in the world. She chooses Sasami Kawai a 10 year old girl. Her rival Ramia does not wish to see Tsunami become queen so she also chooses a magical girl. In the TV series Tsunami was chosen to be queen over two other candidates. Tsunami's wish as queen is to plant flowers across the entire galaxy. Before she can be queen though, she must bring balance to the gemini. She does this by finding someone to be her champion and fight for justice. She chooses Sasami Kawai a 10 year old girl in the 4th grade who attends the Umi no Hoshi Elementary School. She gave Sasami a magical baton so she could transform into the magical girl Pretty Samy. Ramia, one of the other candidates, was angry they chose a flower girl over her to become queen. So she also chose a someone to become a magical girl. Her evil magical girl is there to cause trouble for Pretty Samy and prevent the gemini from becoming balanced. Sakuya exists only in the Shin Tenchi Muyo series and as such she probably doesn't "belong" on this page. I like her almost as much as I like Sasami so she gets to be placed on this page. She is a very likable character with whom I became quickly attached to. 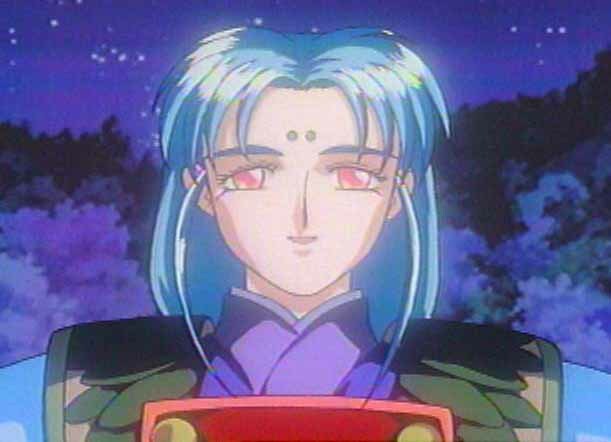 It was her "death" within the series that originally made me the Tenchi Muyo fan I am today. 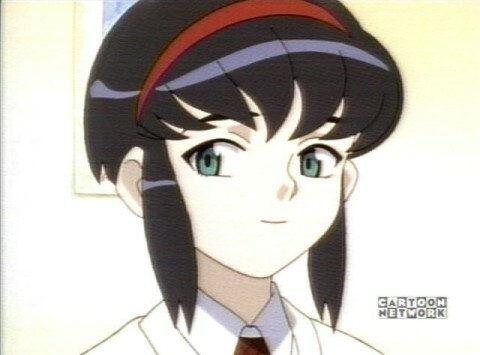 Sakuya Kumashiro is a girl who goes to the same school as Tenchi when he is in Tokyo. She falls in love with Tenchi and Tenchi falls in love with her. In spite of being an outgoing and cheerful character most of the time there is a dark side to her. 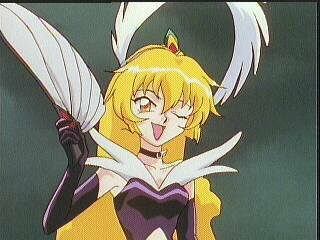 She is a creation of Yugi who's only purpose is to drive away the other girls from Tenchi. She has no knowledge of this however. Tsunami, in all of her carnations is kind of a "spacey" in the way that she usually seems misinterpret things said or just doesn't seem to know things are being said. Often giving false information on unknowingly. Usually cheerful even during a crisis, often naive of how bad a situation actually is. She is a quirky kind of character that has unusual luck often just missing trouble without realizing the trouble was even there. As you might have guessed I am a member of the #SAS# (Sasami Appreciation Society). For more information you should visit their website.